A new cost guide from the Masonry Advisory Council is in development. It has long been, and in many cases is still, the opinion of design professionals, code officials and legislators that non-combustible, more robust construction solutions are significantly more costly than other alternatives such as wood with gypsum fire walls with sprinklers. This was combatted with the original 2005 Fire Safety Construction Cost Study, which documented in many cases these types of construction models can be used on an equal financial footing as the more lightweight models like metal stud and light wood frame. With the exception of the 2005 Fire Safe Construction Cost Comparison Study, there is no reliable published documentation available to refute the perception regarding the increased building cost associated with this approach. 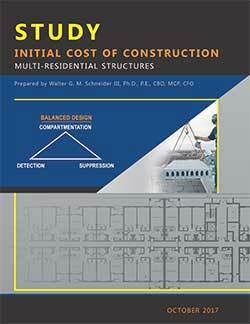 Based on this lack of information, and perceived changes in the code and construction environment, the design of an updated comparative study was undertaken to accurately document the initial cost of construction a common multi-family residential building. For the Chicago, Illinois cost comparison it was decided to use union wages based on the local construction climate. The reader is referred to the Study, initial Cost of Construction, Multi-Residential Structures, October 2017 original report for a complete discussion on study design and methodology.